Oscar Wilde was born in Dublin, Ireland on October 16, 1854. He was educated at Trinity College, Dublin and Magdalen College, Oxford. He was considered a brilliant student. In 1878, his poem Ravenna won the Newdigate Prize. Shortly after leaving university his first volume of poetry was published. He moved to London in 1879. Wilde married Constance Lloyd, the daughter of a wealthy Dublin barrister, in 1884 and the couple had two sons. Wilde wrote fairy stories for his boys. These were later published as The Happy Prince and Other Tales. In 1897, after being released from Reading Prison, Wilde moved to France. A year later he wrote The Ballad of Reading Gaol, a poem inspired by his prison experience. 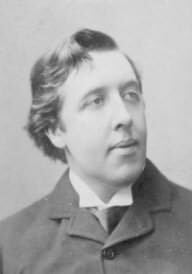 Wilde's time in prison badly damaged his health and he died on November 30, 1900, in Paris, France, three years after leaving prison. He is buried in Pere Lachaise Cemetery in Paris, in a tomb designed by Epstein. Men always want to be a woman's first love. That is their clumsy vanity. We women have a more subtle instinct about things. What (women) like is to be a man's last romance. A poem written during Wilde's sting in prison following charges of homosexuality. Simone, a merchant, returns from a business trip to find his wife in a compromising situation with Prince Bardi. After some time, Simone challenges the Prince to a duel, ultimately killing him. The situation brings new understanding to the husband and wife. A collection of short stories, including "The Remarkable Rocket," "The Selfish Giant," "The Devoted Friend," "The Nightingale and the Rose," "The Young King," and "The Star Child." A rising politician with a secret tries to prevent exposure of his past by showing the hypocritical standards we hold our leaders to. Lady Windermere receives an ornate fan as a birthday present from her husband. She hears gossip that her husband is cheating on her, and she begins to have affair, herself. Mrs. Erlynne takes the fall after Lady Windermere's fan is found at the house of Lord Darlington. Moral tale of Dorian, a beautiful youth who gets his portrait painted, then proceeds to become cruel and watches in horror as his painting feels the effects, but he stays youthful. A social play about the revelations that take place during a party at the country home of Lady Hunstanton. Gerald Arbuthnot has been appointed as the secretary of Lord Illingworth, a man notorious for his skills as seducer. While at the party, his female conquests must act as though nothing had happened between themselves and Lord Illingworth, including Mrs. Arbuthnot, who must decide whether or not to make her secret known.